As some of you might know, I have been working on video courses for Blocs for some time. The main course is still one month away from being completed, but the basic Getting Started with Blocs course is available today. This course includes 14 videos designed to help a complete beginner to build a website in Blocs from scratch. P.S. As always, huge thanks to @mackyangeles for helping with logo design. No problem @Eldar! Always here to support you bro! Keep it up. Vice nice @Eldar I’m sure this is going to help a lot of new users. Hey nice shirt in the opening video! On mobile the buttons gets merged together. And the list text is huge on mobile. @Eldar one other suggestion might be adding a small down arrow (icon) under the headings. I looked at the course listings and didn’t really know the course info was hiding below. Really like how you laid it out just thinking maybe a little helper to go with them might help lead the user to the info. one other suggestion might be adding a small down arrow (icon) under the headings. I looked at the course listings and didn’t really know the course info was hiding below. Really like how you laid it out just thinking maybe a little helper to go with them might help lead the user to the info. That’s actually a good point. Thanks! I will think how to make it more obvious without damaging the simplicity of the design. I have completely rebuilt the page to address the issue you were talking about. Please let me know whatever the new version is better or not. Now thats SWEET! Love the popup signup on the desktop view. I’ve not seen that done with Blocs. I think the play arrow is really helpful. I’ve found asking for advice on a new design very helpful. I’ve had a lot of forum members give me great feedback (suggestions). I find if I’m really open to feedback I normally come up with a better design. I went through the videos and you did a really nice job explaining the basic features. 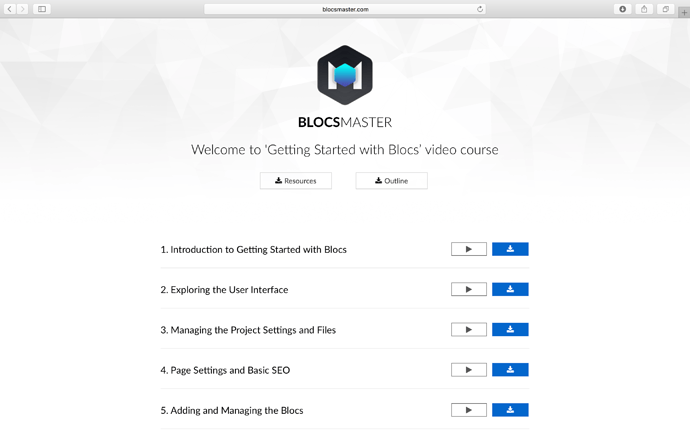 If new users sign up and take the free course it will really give them a jump start using Blocs. I’m looking forward to seeing the Bloc Master course outline. I totally agree with you. Feedback and suggestions from other users are really helpful, as well as constructive criticism. I am working very hard on ‘Becoming a Blocs Master’ series at the moment. I will check the forum for more topics to include in the series. Probably the best user to analyze the Blocs sites in our community! I agree @pauland has helped me several times. I know a lot of users help members but I think @norm should give pauland the forum helper of the year award. Thanks for the kind words from you and Eldar. Eldar, I’ve looked at some of your videos and they really are good - the high production values in the lessons are evident and you really know your stuff. Not taken a hard look at your site, but… why is “About me” on this page? I’ve certainly commented on a fair few websites, but really it’s only where I think people may be going astray. I’m no definitive expert in this field and I’m reluctant to be some kind of website filter on the forums. @Eldar I did see one error in the footer. You have the @ symbol next to copyright. Maybe should be © symbol. Paul, I thought this site should have a section about the creator, but I guess I shouldn’t put it in the global footer area, and just leave it on the home page. You are saying that there are people who know more about Blocsapp, CSS, and JS in our forum, and that might be true, but that’s not what makes you the best helper. It is the effort and time you are investing in writing each and every post here. Plus, I like that you are very direct with your suggestions. should be become a special badge for their help and efforts. These guys are all 'wall-of-fame material"! The videos are really great and very helpful. You got me, I’ll pay for the upcoming videos. when you change your page once or twice a year.